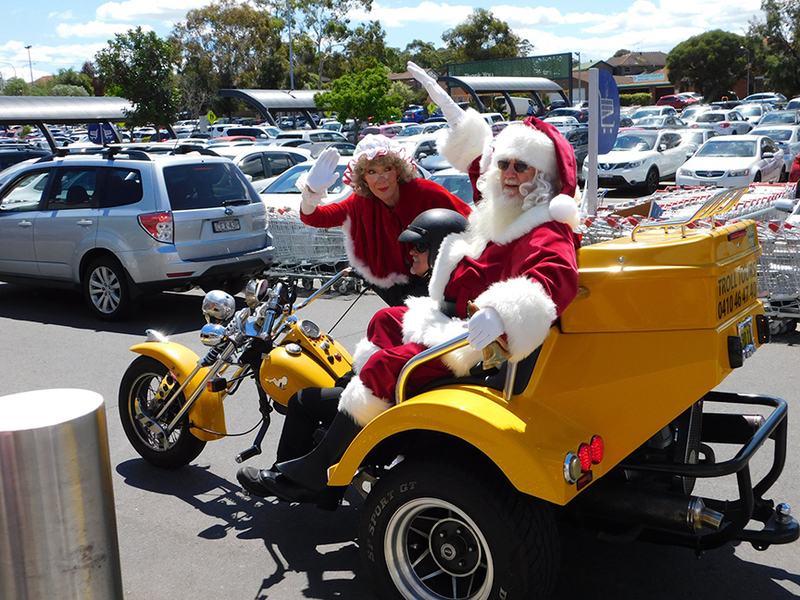 Santa is celebrating in Sydney already and he decided it was easy to organise a trike ride with us. A lot easier than organising his reindeer. Craig on the yellow trike picked Santa and Mrs Claus up in Casula, a south western suburb of Sydney. 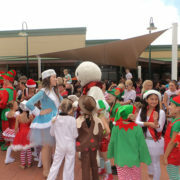 They joined the Christmas parade around Casula Mall with the elves, fairies, toys and a brass band. Everyone had such a fun time and got into the Christmas vibe. If you ‘d like a Santa is celebrating in Sydney visit please let us know. Santa can come on the trike to take your kids for short rides around home or school. Or he can take you, your friends or employees on a Christmas party ride/transfer – even with out Santa. Santa Claus, also known as Saint Nicholas, Kris Kringle, Father Christmas, or simply Santa, is a legendary figure originating in Western Christian culture who is said to bring gifts to the homes of well-behaved (“good” or “nice”) children on Christmas Eve (24 December) and the early morning hours of Christmas Day (25 December). The modern Santa Claus grew out of traditions surrounding the historical Saint Nicholas (a fourth-century Greek bishop and gift-giver of Myra), the British figure of Father Christmas and the Dutch figure of Sinterklaas (himself also based on Saint Nicholas). Some maintain Santa Claus also absorbed elements of the Germanic god Wodan, who was associated with the pagan midwinter event of Yule and led the Wild Hunt, a ghostly procession through the sky. Santa Claus is generally depicted as a portly, jolly, white-bearded man—sometimes with spectacles—wearing a red coat with white fur collar and cuffs, white-fur-cuffed red trousers, a red hat with white fur and black leather belt and boots and who carries a bag full of gifts for children. This image became popular in the United States and Canada in the 19th century due to the significant influence of the 1823 poem “A Visit from St. Nicholas” and of caricaturist and political cartoonist Thomas Nast. This image has been maintained and reinforced through song, radio, television, children’s books, films, and advertising. Santa Claus is said to make lists of children throughout the world, categorizing them according to their behavior (“good” and “bad”, or “naughty” and “nice”) and to deliver presents, including toys, and candy to all of the well-behaved children in the world, and coal to all the misbehaved children, on the single night of Christmas Eve. He accomplishes this feat with the aid of his elves, who make the toys in his workshop at the North Pole, and his flying reindeer, who pull his sleigh. He is commonly portrayed as living at the North Pole, and often laughing in a way that sounds like “ho ho ho”. Thanks to Wilipedia. Harley-Davidson Motorcycle History – read the interesting story. We only use Harley-Davidson single seater motorcycles on our tours, all the sidecars we have are genuine Harley-Davidson ones. It is an iconic American motorcycle and was founded out of a small shed in 1903 by William S. Harley and brothers Arthur and Walter Davidson in Milwaukee, Wisconsin. The Motor Company produces traditional cruiser motorcycles utilizing air-cooled V-Twin engines. Harley-Davidson incorporated in 1907, with William Davidson officially joining forces with his two brothers and Harley. Setting down roots in Milwaukee, Harley-Davidson began hiring employees and by the end of the decade were producing bikes using its signature 45-degree air-cooled V-Twin. http://trolltours.com.au/wp-content/uploads/2016/08/logo.png 0 0 Kat http://trolltours.com.au/wp-content/uploads/2016/08/logo.png Kat2018-10-24 19:04:402018-10-27 11:19:53Harley-Davidson Motorcycle History - read the interesting story. Have you ever heard the nickname “Hog” when applied to Harley Davidsons? Beginning in 1920, a team of farm boys became known as the “hog boys”. They consistently won races and the group had a live hog as their mascot. Following a win, they would put the hog on their Harley and take a victory lap. In 1983, the Harley Davidson Motor Company formed a club for owners of its motorcycles, taking advantage of the long-standing nickname by turning “hog” into the acronym HOG. This stands for Harley Owners Group. Harley-Davidson attempted to trademark “hog”, but in 1999 lost a case against an independent Harley-Davidson specialist, The Hog Farm, New York. A court ruled that “hog” had become a generic term for large motorcycles and therefore couldn’t be protected as a trademark. A Father’s Day present Sydney is so hard to buy! Does he really want more socks or chocolates? 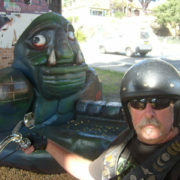 We think he’d prefer a Harley or trike ride with Troll Tours? We love chocolate but have tried every sort there is and it is still forgettable, so how about getting your dad a present he will remember forever! The Harley and trike rides really are a fun, memorable experience. We promise he’ll love you more for it. 🙂. Father’s Day present Sydney – done and dusted! As a Father’s Day Special we are giving 10% off all rides 1 hour or longer. This great deal is available for a limited time only – until Saturday 02 Sept 2018. If you can’t organise the ride now we can send you a Gift Voucher so he can organise a date later on. They are valid for 12 months. As seen in Flightnetwork’s Australia’s Best Tours of 2018. ‘One Day in Sydney’ – a Troll Tours experience is a must! 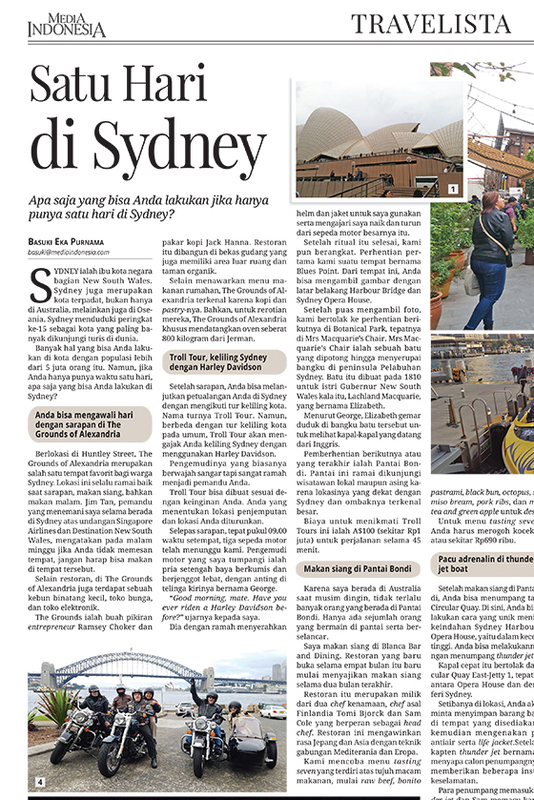 ‘One Day in Sydney’ is an article written by one of a few visiting journalists from Indonesia. They visited the usual touristy areas as they should, Sydney is beautiful and has many iconic buildings and landmarks to see. 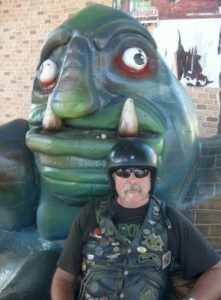 They also went on a Troll Tours Harley tour over the Sydney Harbour Bridge to have a look across the Harbour to the city, the Sydney Opera House and The Bridge from a different angle. They were driven back over The Bridge, past Mrs Macquarie’s Chair which is located in the Royal Botanical Gardens. This place also has a different view of The Opera House and The Bridge, facing west. They travelled on further through the ‘posh’ Eastern Suburbs and out to Bondi. They had a good look around before being driven through the city and to their drop off point. All the journalists had a fun experience on the Harleys and in the sidecar, so we made the list of best things to do in Sydney. This article was published in “Media Indonesia”. It shows that if you have just ‘One Day in Sydney’ or limited time (or plenty of time) take a Troll Tours tour and you are guaranteed to see many of the Sydney sights and have fun doing so. 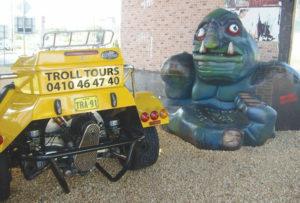 http://trolltours.com.au/wp-content/uploads/2017/07/One-Day-in-Sydney-a-Troll-Tours-experience-is-a-must.jpg 839 560 Kat http://trolltours.com.au/wp-content/uploads/2016/08/logo.png Kat2017-07-19 10:35:392017-07-19 10:35:39'One Day in Sydney' - a Troll Tours experience is a must! As a Mother’s Day Special we are giving 15% off all rides 1 hour or longer. This great deal is available for a limited time only. If you can’t organise the ride now we can send you a Gift Voucher so she can organise a date later on. They are valid for 12 months. We are joking but it’s a good sign and a talking point. 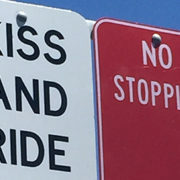 This particular sign is at Blues Point on the northern side of the Harbour Bridge. It’s one of the most popular stops for our trikes and Harleys as there is a wonderful view towards the Sydney Harbour Bridge and the Sydney Opera House. There are other hidden parts of Sydney in this area with great views over the Harbour. Most people don’t even know they exist. I have lived in Sydney all my life (though in different areas) and until Troll took me on a sightseeing trike ride, I didn’t know these places existed. Troll and all our other Harley riders know these areas and can show you too! Christmas on a Harley Trike ride, or a Harley motorcycle tour: Christmas presents – what do you get someone (or more than one) who has everything? You give them a unique gift from Troll Tours – our Gift Vouchers are valid for 12 months so there is plenty of time to use them. Our passengers are equally locals, interstate visitors and tourists from overseas. We cater for everyone whether it is on a Harley or on a trike. Each trike can hold up to 3 passengers so everyone can have a chat while enjoying the ride. Pick a ride from our suggestions or choose a time frame, so when the gift voucher receipient contacts us, they can choose where we take them. It could be popular Eastern Sydney Panorama – including Bondi, The Beach Beauty – including Palm Beach or further afield to include the Blue Mountains with its scenic views of The Three Sisters. Trolls are Taking Over – Beware! The Trolls are taking over Sydney! Troll’s mate has arrived for a permanent holiday in Annandale. He is living under the light rail bridge at the corner of Johnston Road and the Crescent. Can you see the family resemblance? He wants to go on a tour but unfortunately he doesn’t fit on the Harley or trike. Thanks to the Guerilla Gardeners of Channel 10, we need more company as we are a rare species! http://trolltours.com.au/wp-content/uploads/2016/09/S6300844.jpg 480 640 Kerry Richards http://trolltours.com.au/wp-content/uploads/2016/08/logo.png Kerry Richards2016-09-02 04:55:552016-09-02 06:33:31Trolls are Taking Over - Beware!